Remote monitoring of critical sensor data - Robert Owen Inc. Remote monitoring of critical sensor data is simpler using wireless sensor measurement. A typical problem with sensor measurement wiring, how to get the signal connection from there to here. One example is, the temperature of the greenhouse on the other side of the road. The problem may not sound critical in May, but what about in January in the Northern Hemisphere? If greenhouse heaters fail, plants may be damaged and loose value. Other than walking across the road or manning the greenhouse constantly, it may seem like there is no easy solution. An answer you may hear is, run an elavated cable over the road, or bury a cable under the road. Neather solution may be accaptable to local government, you may need to remove the work and pay damages/fines. When you think about it or hear it, another solution seems obvious, a wireless connection. It eliminates the problems of roads, distance, and obsticles (like other property). How do you do it? Sounds simple on the surface, transmitter on the remote sening end and receiver where you want to get the data. Well that’s a little over simplified, but it is the main idea. This is not complete of course, you will need sensors, etc. While other things may need to be looked at, when considering the scope of the project, such as: overall distance, line of sight obstructions, differences in elevation of the system ends, available power, weather, etc., the ease of use and the measurement capabilities still sit at the center of the system. 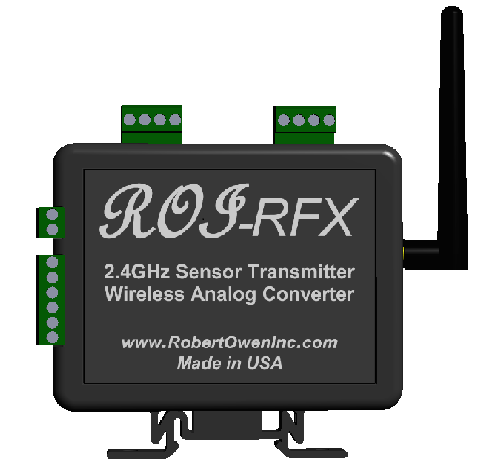 A simple to use wireless sensor measurement module, the ROI-RFX allows sensing of remote site temperature, water level, humidity, soil moisture, and other important parameters. When packaged with remote sites in mind, mounted outdoors where shelter and power is not available, valuable data becomes more readily accessible. Availability of both 2.4GHz and 900MHz, ROI-RFX mesh network radio modems allow a flexible tradeoff between noise immunity, line of site limits, and elevation. Keep in mind, not all greenhouses are small. Many are quite large with several acres under plastic cover. A nice sized green house that we know is 2 acres in size, and this is only 1 of a number of greenhouses on the same site. All of the greenhouses on the site are located far enough from the offices, that a vehicle is used to travel between them. A simple way to read a multiple thermistor temperature sensors located in soil, air, and on the surface of heating fluid pipes of a greenhouse, is a wireless connection. With 4 input measurements possible per sensor tranmitter, a single transmitter could be used if all the sensors are near each other, otherwise multiple transmitters are used in the same greenhouse, to keep the sensor wiring minimum. Not only is the wiring simpler to manage with a wireless connection, but the transmitters can be relocated if necessary to suite changes in the monitoring needs. When you have the transmitter locations determined, how you plan on powering them, how you will protect them prom the environment (when necessary), you will need to have a plan on the RF connection layout. 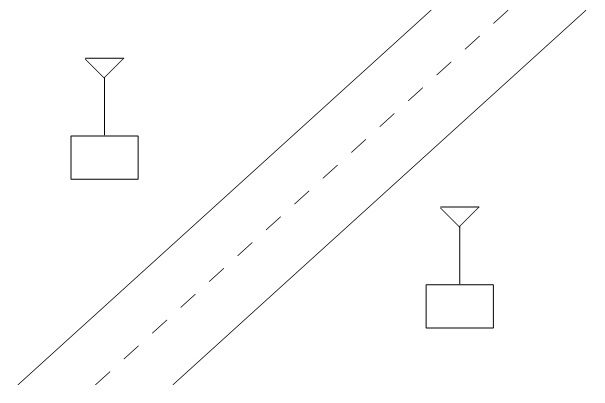 High frequency radio transmissions need to be line of sight, in otherwords no obstructions between the 2 antennas. This can be accomplished either by locating antennas so that they have full visible access to each other, or using repeaters when they are low height and need to see around corners. A good way to start is a sketch of the property, with a view both from above and a side view, noting elevations, distances, and heights. 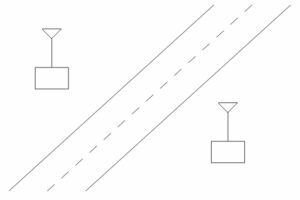 This way thought is put into the potential obstacles and the placement of transmitters. Generally it doesn’t need to be fancy, a pencil/pad/ruler sketch is suitable. Using a common PC scanner, the document can be sent for evaluation easily.